A last gasp header from Harry Kane broke Tunisia’s ferocious resistance and ensured England won their World Cup opener for the first time since 2006. The Tunisians’ defending resembled something straight out of Ultimate Fighting Championship at times, but the officials failed to award a couple of clear penalties. When Jesse Lingard hit the post in the second chance and several teammates fluffed their lines in front of goal, it felt like developing into one of those nights. But the Three Lions remained calm and they were rewarded when Kane broke free of his marker and nodded in the winner. On the touchline, England’s waistcoat clad manager Gareth Southgate clenched both fists and roared with delight. It was a rare display of passion from a mature, measured individual, and it showed how ecstatic he was to break the trend that has seen England struggle in their World Cup opening games. It was not exactly an emphatic victory, but after watching Brazil, Germany, Spain and Argentina all fail to win their opening games, it provided a sense of relief and optimism. Southgate was not a universally popular choice when brought in to replace Sam Allardyce in 2016. His only previous top-level managerial experience came at Middlesbrough between 2006 and 2009, during which time they suffered the ignominy of relegation to the Championship. He took over as manager for England’s under-21 team in 2013 and led them into the European Under-21 Championship, but they finished bottom of their group and crashed out, so he was exactly renowned as an elite coach. He was a natural choice to fill in as interim manager when Allardyce was sacked in disgrace following a newspaper sting, as he was well known to the FA. But his appointment did not set pulses racing among the fan base, and he was not expected to remain in charge on a permanent basis. Yet he did a pretty good job of steering the ship through exceptionally choppy waters. England were a total mess back in 2016, after being dumped out of the Euros by Iceland and then having to sack Allardyce a mere 67 days into his reign. Southgate led them into four games as temporary coach, securing two wins and two draws, and he was handed the full-time job in November after proving to be a steadying influence. He won 10 out of 17 games in charge, leading the team to qualify for the World Cup in comfortable fashion, but his pedigree has still been regularly questioned by many fans. The doubters have said he lacks the fortitude to make tough decisions and the tactical nous to thrive in the role. But he continues to silence them by acting boldly and staying true to his principles. He dropped record goalscorer Wayne Rooney early on in his reign and built the team around Kane, a decision that has been thoroughly vindicated by both players’ respective form. He handed the Tottenham striker the captaincy when many were arguing the case for Jordan Henderson, and Kane rose to the responsibility by scoring twice in England’s 2-1 victory over Tunisia, leading by example. Southgate has no time for any defenders that are not good enough on the ball, so Chris Smalling has been frozen out. He has ruthlessly axed Joe Hart and Jack Wilshere and he resisted the temptation to bring in Jonjo Shelvey. He has decided to give youth a chance, relying predominantly on the players he coached during his time with the under-21 squad, and England’s energy and vitality was clearly evident against Tunisia. They were wasteful in front of goal, but there was no questioning the team’s intensity and dynamism. Most of the best teams in the world play a hard pressing game nowadays, and you can only do that if you have quick players with great stamina. By selecting young stars, Southgate has allowed his team to play in this way, and it could prove highly effective. He has also taken bold tactical decisions. He recognised that England are far better in attack than in defence, so he mitigated against it by deploying three at the back. Most managers would have played Kyle Walker at wing-back, but it was an interesting move to put him in a back three, as his pace should allow him to cover for any mistakes made by John Stones and Harry Maguire. 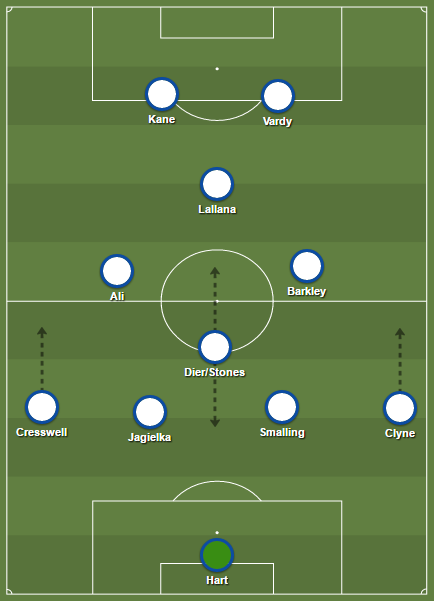 Southgate is pioneering an unusual formation that fields a holding midfield, two attacking midfielders and two forwards. It is a sort of 3-5-2, but it is by no means a traditional version of it, and it is innovative and interesting. The players seem relaxed and confident, and Southgate’s positive influence on the group is clear. It resulted in an exciting, attacking performance on Monday. The 2-1 scoreline massively flattered Tunisia, who created nothing. They scored from the spot after Walker gave away a soft penalty, but they were second best throughout. If Raheem Sterling and Lingard had been less profligate in front of goal, England would have hammered their opponents. 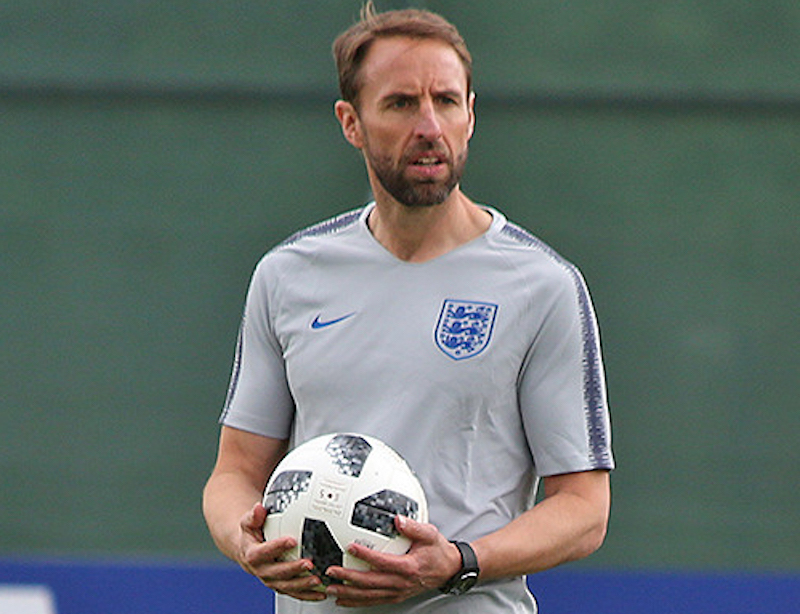 It augurs well for the rest of the tournament – as you can see, England are among the favourites to lift the trophy – and it is time for Southgate’s critics to pipe down, get behind the team and help roar the Three Lions on during this tournament. Featured image by Кирилл Венедиктов, used under the Creative Commons Attribution-Share Alike 3.0 Unported license.